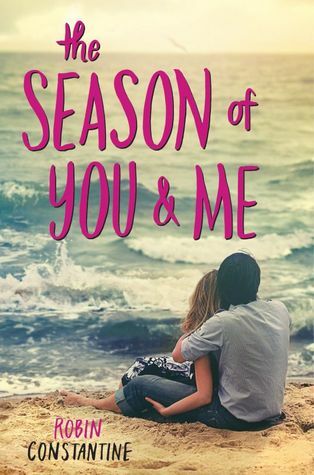 Goodreads says, "From Robin Constantine, author of The Promise of Amazing and The Secrets of Attraction, comes a funny and heartfelt summer romance set in New Jersey. Perfect for fans of Sarah Mlynowski, Jenny Han, and Morgan Matson. Cassidy Emmerich is reeling from a sudden, humiliating breakup. The last thing she wants to do is stick around and be reminded of her ex everywhere she goes. On impulse, she decides to spend the summer with her father and his family at their Jersey Shore bed-and-breakfast. A different scene and a new job working as a camp counselor seem like the perfect recipe for forgetting Gavin as quickly as possible—not to mention for avoiding him until he leaves for college. Bryan Lakewood is sick of nevers. You’ll never walk. You’ll never surf. You’ll never slow dance with a girl and have her put her head on your shoulder. Last year he made one false move—now he’s paralyzed and needs to use a wheelchair. But this summer, he’s back at his camp job and is determined to reclaim his independence—and his confidence. Cass is expecting two months of healing her broken heart. Bryan is expecting a summer of tough adjustments. Neither is expecting to fall in love." Cassidy Emmerich's boyfriend, Gavin, cheated on her and she is devastated. She was supposed to spend the summer with him, but obviously, plans have changed. Cassidy, or Cass, wants to get away from it all, so she decides to spend the summer with her father's family at the Jersey Shore. She couldn't think of a better place to heal her heart. She gets a job working as a camp counselor and in turn, meets a lot of new people, including Bryan Lakewood. Bryan isn't your average teenager though. Due to an unfortunate accident, he is paralyzed and uses a wheelchair. He also has many obstacles facing him this summer; he is trying to gain his confidence back and in walks Cass who gives him butterflies. Robin Constantine's The Season of You and Me stole my heart. I thoroughly enjoyed this beach read. I really liked Cass from the get-go in The Season of You and Me. I felt for her when her boyfriend cheated on her and essentially humiliated her thanks to social media. She wants to get away from it all this summer and not see her ex-boyfriend everywhere. Even though she isn't that close with her dad, she decides to spend the summer at his Jersey Shore bed and breakfast. At first she is hesitant, but after some time passes, she realizes this is the perfect thing for her. Also, I loved Cass' relationship with her mother and grandmother as well. Anytime there's a grandmother in young adult literature that plays a role in a teenager's life, I love it. Bryan Lakewood is such a great character. He's complex, has struggled, but, like everyone else, is just trying to find his way. I loved his story and his strength in The Season of You and Me. I want more characters like this in young adult literature. As Bryan spends more time with Cass, he realizes that he has strong feelings for her and it isn't just something that is fleeting. I really adored their summer romance. I have been going to the Jersey Shore for years, so I especially loved the setting of The Season of You and Me. Constantine did a great job depicting the locals versus the summer visitors or "Bennys." She also brought to life the beauty of the shore, the fun locations surrounding the shore, the charm of a sleepy beach town, and even those "diamonds." I couldn't help but think that Constantine was inspired by Cape May, one of my favorite places in the world. It sure felt like I was there when I was reading this novel. This is the first book I read by Constantine and I really enjoyed it. Her writing felt authentic and she captured summer romance perfectly. She also depicted life at the Jersey Shore very well and brought to life that one special summer beautifully. The Season of You and Me is one of my favorite books of the year and I plan on reading more of Constantine in the future. Once I saw this cover I knew I had to read it. Been seeing great reviews and need to get this one up on the TBR. Growing up we went to Myrtle Beach and my best friend and I would go with each other's families. That way we would end up with 4 weeks in MB. So yes, there were summer romances there. Definitely add it to your TBR! 4 weeks in Myrtle Beach sounds amazing. You'll definitely appreciate this novel. Thanks for visiting! Nice review Christina! I've never been to the Jersey Shore but this sounds like a fun book with a great setting. I haven't read her books before but I'll be sure to check this one out from the library this summer. I think you'd enjoy this one, Christina! Thanks for checking out my review.